New Jersey’s Consumer Fraud Act has been expanded over the years by the courts and the legislature to the point where it is no longer focused on protecting consumers from fraud. It is instead a catch-all claim that is pulled into all sorts of disputes – consumers and fraud optional. A few recent cases really illustrate this point. As reported by the New Jersey Law Journal, the state of New Jersey is currently suing Standard & Poor’s Financial Services over the rating company’s rating of “structured finance securities, also known as asset-backed securites [sic], which include mortgage-backed securities involving subprime mortgages, which were central to the 2008 economic collapse.” Whether the state itself can be considered a consumer under the CFA is one of the key questions in this case. So far, the court has said yes, the state can be considered a consumer under the Act. This means the government is now the author of the law, its enforcer, and the party the law seeks to protect. There is no better example of consumer-less CFA suits than, Unilever v. Hampton Creek, Inc. Unilever, the maker of the popular mayonnaise brand Hellmann’s, filed a lawsuit in federal court in Newark against the popular start-up company Hampton Creek over its competing product, Just Mayo. Unilever was clearly using New Jersey’s ConsumerFraud Act to seek retribution against its business competition, not looking out for the interests of the common man, when it filed the case. The fraud alleged in the Just Mayo case had to do with product labeling, which is another bourgeoning area of CFA lawsuits. Two recent examples are the Tito’s Vodka and fresh baked bread class actions. In both suits consumers are alleging adjectives on the product labels tricked them into buying inferior products. These suits are becoming so common that New Jersey is now second only to California in the number of food based lawsuits filed in state. Many cases filed under the New Jersey Consumer Fraud Act are not stand alone CFA cases; they are being brought under other statues and the CFA claim is tacked onto the complaint. Why is the CFA pulled into so many disputes? The answer lies in the Act’s remedy provisions. In most cases, when a plaintiff wins their lawsuit against a defendant, the defendant owes the plaintiff only the damages the plaintiff was able to prove at trial that they suffered. In a CFA suit, if the plaintiff is victorious, they get 3 times the damages they were able to prove they suffered, plus the defendant must pay the plaintiff’s attorney fees. Under this system, one could argue that it is malpractice not to throw in a CFA claim – why should a plaintiff only be made whole when they could be made whole and then some? Talking about what lawsuits are incentivized by the law on the books is a conversation we, as a state, need to have. We must strike a balance between protecting consumers and compensating litigants who have been made whole through other claims. Sen. Oroho (R-24) and Asm. O’Donnell (D-31) have opened the dialogue on this topic by introducing a bill Senate Bill 2293/Assembly Bill 3497, which would, among other things, allow courts to use their discretion in awarding treble (triple) damages and attorney fees in CFA cases. NJCJI strongly supports this common sense reform. 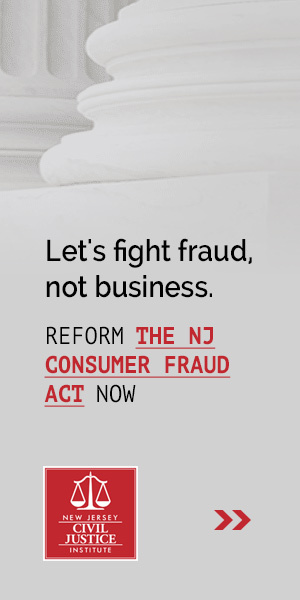 Click here to learn more about NJCJI’s efforts to reform the Consumer Fraud Act.